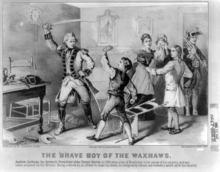 Andrew Jackson, 7th President of the United States, was born and raised in the Waxhaws. The exact site of his birth is uncertain; Jackson claimed that it was in a cabin on the South Carolina side of the border. A strong local tradition says that he was born north of the border. James K. Polk, the 11th President of the United States, was also born in the Waxhaws district, in what is now Pineville, North Carolina.